I must admit to having a bit of a thing for Danelectro guitars, amps and effects. They just manage to be effortlessly cool but the looks are backed up with quality gear. With the Danelectro Hodad DH-1 mini amp you have all of the retro cool that you would associate with Danelectro gear but do you get the quality. 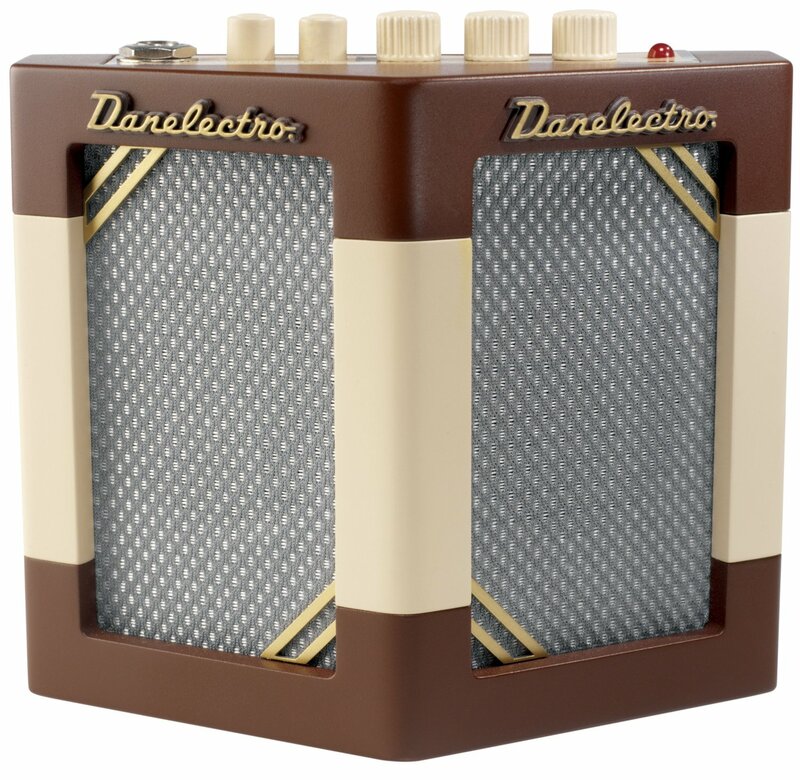 Danelectro was founded by Nathan Daniel in 1947 initially producing only amplifiers for the likes of Sears, Roebuck and Company and Montgomery Ward. However, in 1954 Danelectro extended their production ambitions to the manufacturing of solid body guitars. They went onto gain a reputation for producing great looking, no frills guitars with reasonably good tone at a low price. Danelectro are perhaps more fondly remembered for the introduction of the “lipstick tube” pick-up. As the name suggests the pick-up was invented by placing the entire mechanism inside spare lipstick tubes. However, the Danelectro story is not one of unbridled success. The company was sold to MCA in 1966 and the Danelectro plant was closed by MCA in 1969. In the late 1990s the Evets Corporation started selling copies of old Danelectro guitars but this never picked up and was eventually stopped in 2001. Since then the Danelectro name has become more strongly associated with guitar effects pedals. However, Danelectro also produce a small range of amps of which the is an example. What is the Danelectro Hodad DH-1 mini amp? The Danelectro Hodad DH-1 mini amp is a little amp with some great sounding retro sound effects. The Danelectro Hodad DH-1 mini amp is, as the name suggests, a small practice amp which captures all the retro-cool that you would expect from a Danelectro product. The amp has a V-shaped front with brown and cream plastic exterior and a silver diamond grill cloth. The amp itself measures 40.6 x 31.8 x 33 cm and is a light-weight desktop practice amp. The features of the Danelectro Hodad DH-1 mini amp include twin speakers, gain and tone controls and two in-built effects in the shape of a vintage style tremolo and echo. The vintage tremolo is controlled by a speed control and the echo has a fixed delay time. Both effects can be accessed by push buttons situated on the top of the amp. Powered by a standard 9 volt battery or power adapter (not sold with the amp) the Danelectro Hodad DH-1 mini amp is a portable little practice amp. Sadly however I think its portability would have been improved with the inclusion of a belt clip. The amp sound is good but don’t expect it to be loud. I would say that it is sufficient for practicing in a bed-room so is perhaps an ideal first amp for a new guitarist. The gain can get a little bit harsh if you turn it up too far but the clean sound is great. The good thing about the Danelectro Hodad DH-1 mini amp is the rather interesting sounding effects that you can get when the vintage tremolo or echo are engaged. To my mind if you are looking for a retro sound then this is a pretty good little practice amp and for just £36 I think that it is good value for money too. However, if you are looking for something that you can turn up to 11 and rock with then the Danelectro Hodad DH-1 mini amp is perhaps not for you. If you like the look of the Danelectro Hodad DH-1 mini amp then you can buy it now through Amazon for £36.